As long-time readers will know, I do a lot of thinking (and whining) about the price of whisky. Every decision I make at the store and every review I write is influenced by the dollar amount on the bottle’s price tag. I even skip “the spit” at a whisky event like WhiskyFest or Whiskies of the World if the pour is above a certain price point. This is, I think, a little unusual. Pick up a whisky book or magazine or read some professional reviews online, and while you might see a mention of the suggested retail or average price of a dram, it rarely impacts the review or recommendation. Professional reviewers, as a creed or something, appear to review whisky solely on its merits. I guess there’s a good reason for that – one person’s stretch goal is another person’s pocket change, and prices do fluctuate (down, but mostly up) over time, or as they enter the secondary market. Still, give me a “98 point” pour and tell me it costs $1000 a bottle and I’m not going to recommend it. To anyone. Give me a “90 point” pour and tell me it’s $20 and you’ve got a “net promoter” customer for life. More importantly, I feel that the ratio of quality to price is the most relevant (although subjective) metric that I can use to compare whiskies. If a whisky is “good” and has a relatively low price, I feel that gives it an advantage over a whisky that is “great” but has a price vastly inflated beyond its quality. You may feel differently. So, when reader Tony sent me the following graphic, it resonated. Tony coined the term “Go Zone” to refer to his whisky-buying decision-making process. The curve represents the ratio of Tony’s subjective enjoyment of whiskies versus amount paid. As he notes, while some “gems” (outliers) might be found in his sub-$40 zone, most bottles in that range deliver below-average enjoyment for him. Similarly, the more he pays for a bottle over $80, the less likely he will feel happy with his purchase, even though whisky in that range tends to be objectively better (arguable, that). I’ve spent about $200 2-3 times and $100+ another 10 or so. I’m typically underwhelmed when I spend that much (thankfully). $50-80 seems to be my sweet spot as my palate luckily can’t discern stuff much better. Example: I’ve had The Balvenie 12 and 17 Doublewood. I’d MUCH prefer 3 bottles of the 12 versus 1 of the 17 – even if it were a gift. Obviously, everyone’s “Go Zone” curve is different, and doesn’t necessarily adhere to a symmetrical bell curve. Still, I think it’s a valuable exercise to think about your own curve, and let it inform both your purchase decisions and analysis of bottles you’ve bought. Recognizing when a bottom-shelfer rises above your curve and might warrant further examination can save you a lot of cash. Similarly, identifying a splurge purchase that is really worth its high cost (to you) can really help with your enjoyment and appreciation. I suggest sometimes going outside of your curve to find bottom-shelf gems as well as precious splurges. For example, although I rarely purchase or review bottles above $100, I have an unopened bottle of The Balvenie PortWood 21-year on the top of my cabinet. Despite that being a huge splurge for me, that bottle represents the current pinnacle of the journey I’ve taken, and will be opened for a special occasion in the future. However, knowing that $200 is far above my “Go Zone” generally prevents me from wasting money on whisky that I’m just going to regret when I crack the seal. So. What’s your “Go Zone”? Funny you should mention Balvenie 21, because that is my “pinnacle” bottle. I treated myself a couple of years ago when i got my CPA license…I decided I would buy something well into the 3-figure range. Something I wouldn’t normally buy. After that, my next most expensive bottle was Lagavulin Distiller’s Edition, which goes for around $120 in my area. I’ll probably buy another one of those around Christmas, if it’s available. It’s interesting that your two “avoids” were clustered at the top and bottom price brackets. Awesome analysis! Thanks Andrew, that’s very interesting. That lines up pretty closely with my personal experience, where $50 tends to be my “tipping point” for considering a whisky “affordable” but also my mental tipping point for having higher expectations of quality. Cheers! When it comes to whisky I have my favorites like everyone else. I’ve had many different single malts over the years and I always tried to vary my rotation significantly. Lately I find the price of whisky limiting me to my my favorites. On the low end I can get Ardbeg 10 and Laphroaig 10 for $48. I like Ardbeg better but I do love Laphroaig when I’m in the mood for. I can get other favorites like Talisker 10, Springbank 10, Macallan 12, Oban 14 and Clynelish 14 for around $60. When I see something that I am only in the mood for occasionally like Balvenie Doublewood 12 for $60, I now find it hard to make the purchase. I find it difficult to buy Highland Park 12 for $52. 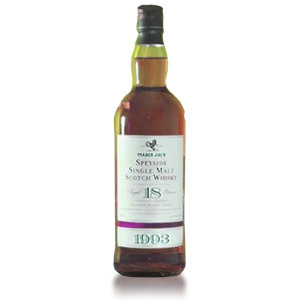 In my mind it’s a similar style to Springbank 10, but would have to be a lot more than $8 To justify the purchase. On the other hand I don’t mind having he occasional bottle of Aberfeldy 12 or Glenmorangie ten for $32 and $38 respectively. I also have a similar palate to Tony in that I really can’t distinguish the better stuff. All in all I just used a lot of words to say that I really don’t mind spending $60 to replace a bottle of whisky that I truly love, whenever it is empty. Although it’s mostly done through the somewhat warped marketing lens of the LCBO, my tipping point is around $100 CAD; beyond that, I start asking “do I really need this, either as a replacement or at all?”. Although I’ve traded for samples of more expensive stuff at different times, the most I’ve spent on a single bottle is probably around $200 CAD. If I haven’t tried something before, the “exploration factor” will sometimes push my purchasing to the higher end but, on the other hand, higher pricing can easily work against bottle replacement once a whisky is a known quantity. I first bought HP 18 at something like $140 and would probably replace it for that, but not at the current $199.95 pricetag. It’s always a game of diminishing returns; twice as much money doesn’t give you twice as much quality, just as twice as much time in cask doesn’t make a whisky twice as good (which isn’t the same thing as saying that what you spend, either on a bottle or on time in cask, doesn’t usually make a discernible difference to the result). Value always declines as prices climb, all (price-based) “gains” in quality are not only subjective (a big issue right there), but also incremental, and people have different minimum standards for both quality and value… and mixing/confusing the two will sometimes cloud people’s thinking. Some people drinking (relative) crap will always think “this isn’t bad really, for $25” while others can’t enjoy a good, relatively expensive, whisky without thinking “yeah, it’s good, but the price is outrageous” – and I’ve thought both of those things, too, at different times. Those who face low quality find solace in good value (Red Label), and those who face low value (sometimes) find solace in good quality (Blue Label). Looking at value, what’s the highest and lowest ends, not of price per bottle, but of people’s product Quality/Price Ratio (QPR?). How much have you, or will you, pay per point of perceived product quality? You usually pay to ride the ride in terms of quality and people still have their personal minimum acceptable standards, but QPR is usually among the best arguments for looking at the bottom shelf. Honestly assessed, the QPR of Red Label blows the doors off of Blue Label in most markets. Many scotch whisky distilleries cater ever more heavily to what my salty-tongued friend calls the rich dumbass market segment: people who neither know nor care about exactly what they are drinking, but who get their rocks off in bragging about the cost of their tipple. Johnnie Walker Blue Label is, by the manufacturer’s own admission, intended to be a status symbol as opposed to simply a quality drinking experience. The growing popularity of scotch across the world has unfortunately led others to imitate this example. Sure, Blue Label IS greatly overpriced – and intentionally so, to go along with the “status symbol” image – but it would easily fall within most people’s idea of acceptable quality for a neat sipper, while Red Label may not. It’s something to consider when noting that Jim Murray has Blue Label (88/100) and Red Label (87.5/100) only half a mark apart in terms of quality. It’s the reason that I can’t trust the Whisky Bible. Macallan appears to have given themselves over almost completely to being status symbol markers. Ever higher prices for an ever larger range of offerings – with almost all of the new bottlings lacking age statements. I thank God every day that I’m not a huge fan of sherried whisky. Ugh. Red label stopped me from drinking Scotch for ten years! When I was in college a long time ago I wanted a sophisticated drink. There was no internet. I figured I could afford very little but how much difference could there be between a cheap Scotch and expensive? So I bought red label. Drank a little. Hated it. Figured it must be me. Drank a little more. Hated it. Figured it must be me. Eventually probably developed alcohol poisoning or such – was very sick – and couldn’t be around even the smell of Scotch for ten years before a waiter introduced me to Macallan 18 back when it was very good. As that was that. Almost the exact same thing happened to me, except it was Famous Grouse… and I asked for a store staff recommendation before buying it… and it was Glenlivet 12, Glenfiddich 12 and Talisker 18 that brought me back. This is the other Jeff from below in the thread. In order for QPR to apply there has to be some Quality to start with. I almost equate JW Red Label with rotgut whiskey that has no quality at all. I just can’t drink the stuff. I like JW Black and Green and feel that they are pretty good values, but the Gold, Platinum and especially Blue Label are grossly overpriced. There are so many 12 to 16 year old Single Malts that are far superior to the high priced JW Blends that I just don’t understand how people can choose them over great Single Malt choices. My current upper limit is $100.00 CAD. There is alot of choice between $40.00 to $90.00 range in Alberta. Then the range opens up. The Ledaig 18yr Old and the Talisker Distillers edition are priced in the $100.00 and up range. I really want to get them, but the price barrier is making me think twice and then again. As another Canadian LCBO shopper, I’m seeing too many single malts climb into “wait for a gift card or the duty free” territory. You can’t get anything decent under 50 CDN, but most NAS bottles over 100 aren’t worth the upgrade. QPR is something I’m very conscious of when buying any spirit, but there are the occasional splurges to try something that I’ve read good things about or is highly sought after (this is more of a Bourbon phenomenon lately) and I have that fear of missing out. My “Go Zone” that is applicable to both Bourbon and Scotch is a fairly large range between $25 and $60. There are certainly many bourbons between $20 and $25 that I enjoy, but the sweet spot for my daily bourbon sippers is probably $25-$40. However, there are several bourbons that I always have a bottle and several backups of that fall in the $40-$60 range. There a few Scotch blends that I enjoy that are below the $40 range (not JW red label), but my sweet spot for a daily sipper Scotch is in the $40 to $60 range. I do buy quite a few Bourbons and Scotches between $60 and $100, but mostly for bottles that are highly regarded for their quality in that price range. Those are purchases that I usually think about a bit unless the price is lower than I normally find in the current market. Above $100 bottles are few and far between in my bar because the QPR is generally so low that I can’t justify the purchase to myself. A QPR example outside of Bourbon and Scotch that I’ve made for years is with Hennessy Cognacs. I really like their VSOP and I always have a bottle. I love their XO when I find it at a bar for a reasonable price for a glass, but I’ve never bought a bottle because XO is not worth the 300% plus price hike over their VSOP. On the other hand, their VS usually costs around 50-60% of the price of VSOP, but it’s not even worth buying as far as I’m concerned. This Jeff is a different Jeff than the Jeff above. Not too long ago, I could find Scotch whisky in the $30 range which appealed to me, but today they are fewer and further between, especially when considering official bottlings. I certainly can enjoy sub-$30 bottles from Tomatin, Glen Moray, and Speyburn, but not are truly fantastic regardless of price. For me, that range of Scotch whiskies starts with bottles like Laphroaig 10, Ardbeg 10, Ledaig 10; all in the $45 range, and others like Isle of Arran 10, Benromach 10, Glenmorangie Quinta Ruban, and Spice Tree, all closer to $50. Above that pricepoint, I find myself feeling a bit snooty and often a bit guilty; but such is life, and if you can, there are several pricier bottles worth indulging in on occasion, or at least once. The priciest bottle “worth” paying-up for IMO would be Glenmorangie Signet. At about $180, there’s simply not else like it on the market (Westland American Single-Malt might be the closest in concept, but not in practice at all). On the subject of great value in lower price ranges, might I suggest a ScotchNoob review of John Barr Reserve blended scotch, which was relaunched this year by Whyte & Mackay. Retails for around $25 a bottle, and was originally developed by what is now Diageo as a replacement for Johnnie Walker in the UK market. A friend of mine speaks quite favorably of this affordable blend. New recipe was developed by Richard Paterson of The Dalmore fame. I’ll look for it, thanks. I’ve heard of John Barr for years, I remember when they were marketing a blue label, and I’ve recently seen the relaunched bottlings, one is a black label, and the other isn’t (possibly red? ), but I’ve never tried either. Oh, that’s a relaunch? I’ve been wondering why I suddenly see it on every store’s shelf. I do like the fact that you’re referring to a specific price point based on value and budget. To answer your question my “go zone” would be under $100. I can find so many different malts in that price point that I enjoy that I don’t feel comfortable spending more than I need to. As a staunch Islay fan my pallet isn’t refined enough to enjoy a $250 dollar bottle of scotch more than a Laphroaig quarter cask. My go zone shifts based on circumstance and availability. In Ontario, it’s $100. Outside of Ontario it might higher because of the price difference elsewhere. In other words, if I spend $130 on a bottle elsewhere that is $280 in Ontario I don’t feel too bad about that. Obviously scotch has gotten very expensive. I lament not getting intetested 8-10 years earlier when I could’ve gotten a lot more for a lot less, but I still hunt for ‘deals’ in Calgary or Duty Free. If I only had Ontario to buy from it would make things very challenging. Even Ardbeg 10 is over $100 now. Where is one to start if that’s the high end of the go zone? The most I’ve spent in Ontario in the last few years would likely be $105 on a bottle of Glenfarclas 15yo. Someone needs to make a 5 year old blend of peated malts, and charge $25 for it. May not be the smoothest thing in the world but I’d drink it, and I suspect a lot of other people would too. Jamie, it’s not a blend, but I believe the whisky you’re looking for is Islay Storm at Trader’s Joes. No Trader Joe’s where I live. Great article! As noted by my silly graph (was done as a joke with some of my buddies after a pretty heavy night of drinking), I find my ‘Go Zone’ right about $50-65. For that I can pick up some of my favorites: Balvenie Doublewood 12, Glenfiddich 15, Dalmore 12, Laphroaig 10, Tamdhu 10, Highland Park 12 (I always have a Doublewood 12 or Fiddich 15 in my rotation of 6 or so bottles, ALWAYS). I stretch that occasionally to pick up a few ‘stretch favorites’ such as A’Bundadh, Caribbean Cask 14, Lagavulin 16 (my God, that A’Bundadh!!). I also have a few I pick up for when I want a budget scotch, something to drink when I don’t want to think about it or when I want to have one too many. This is the under $40 crowd and I look to Glen Moray Port Cask, Bank Note, Johnnie Black or Great King Street. Over the years, I’ve splurged and picked up Glenmorangie 18, Glenfiddich 18, Balvenie Doublewood 17, Balvenie 15 Single Barrel, Glenmorangie Bacalata, etc. Not one of those has completely blown me away in that I have to buy another bottle. I have been treated when out and about for business meetings and have sampled Johnnie Blue, Macallan 18, Macallan Rare Cask and others. I don’t think I’ve picked up or sampled a $100+ bottle that I’d re-purchase for my own enjoyment. So, to this day, I’ve yet to find that $100+ bottle I’d repurchase, because as I’ve said – I’d rather have 2-3 of my ‘Go Zone’ bottles versus 1 of the others. Having said that, I haven’t given up my search. Every year, around the holidays I pick up 1-2 ‘Special’ bottles ($100+) that I open on Thanksgiving and savor through the New Year. It started off around the $100 mark and this year has stretched to $230 (Balvenie Portwood 21 – funny how that exact bottle has been mentioned 2-3 times above!). It also started off as 1 special bottle, but now it has been ‘stretched’ to 2. I have a GlenDronach Cask Strength Batch 2 ready to pop during the holidays. Aside from the holidays, when I hit the store – I find myself buying 1 ‘Go Zone’ favorite, either an under $40 budget bottle or a ‘stretch favorite’ (depending on current inventory and need) and then something in my ‘Go Zone’ from a price perspective – but something I’ve not yet had. The reason behind the last bit is because it is most likely to deliver enjoyment based off of past experience. Sorry for the rambling. Thanks for all the interesting responses so far. Cheers! I also live in Ontario so my perception is a bit different. My “Go-Zone” is $25-$80. I almost never spend more than $100. There are plenty of good Canadian whiskies, bourbons near the lower end of that spectrum (Lot 40, Wild Turkey 101) and some respectable scotches in the mid to upper part (Benromach 10, Aberlour 12 Double Cask, Compass Box Peat Monster). Ardbeg 10 is $100 so it’s a rare treat. Lagavulin 16 is $125 so I only buy it once every 12-18 months. Highland Park 18 is now $200 so I’m glad I tried it at a friend’s place. It is NOT worth that much. I’m in Virginia (state liquor stores). My Go Zone is $20 to $60. I have blended Scotch down at the low end (Teachers) and nice single malt Scotch at the high end (Ardbeg 10), as well as the blended malt Peat Monster (available in DC, not in VA). While Lagavulin is $106 in VA right now, I can get it in both DC and NYC around $65; it is my favorite. Bourbons are in the $25 to $40 range. When Knob Creek dumped the age statement, I dumped them. Now it’s Jim Beam Bonded and Wild Turkey 101, both around $25. My goal has been to get the best values I can find in both Scotch and bourbon. I don’t care to spend crazy amounts of money on whisky. I like having a range of whisky that I like so that if I’m out and want a wee dram, I can look at what they have and usually find something I like. Thanks mr Noob. A great article that discusses something that all consumers consider. Price versus quality. The $50 amount is pretty spot on. Plus, I’d much rather pay $100 for two bottles of scotch over just one that is a bit better. Thanks for adding to the conversation. ? While value (QPR) is important to me there are some whisky experiences that are unique and only available at a somewhat higher price. I generally look at value in terms of the price I pay versus *both* the quality and the current market price. For example, based on several very positive reviews, I really wanted to try Glengoyne 21. Hard to find in my area and when you do it goes for $180-$200 USD. Too steep for my budget so I found it online for less during a sale promotion for an extra 10% off. I grabbed two bottles for $118 each, delivered. No sales tax as it was shipped from another state. I also picked up two bottles of Springbank 12 Cask Strength under the same promotion to reduce shipping costs/bottle. I liked Springbank 10 and 15 so it was an easy decision. Note that this isn’t quite the same as buying the cheapest bottle you can find that still tastes decent. We all do that on occasion! GlenDronach 21 Parliament is another one that goes for exhorbitant prices in my area. Bought it online for $116 delivered about a year ago. Even relative staples such as Lagavulin 16 and Balvenie Caribbean Cask 14 can frequently be found online and delivered to your front door for substantially less than local prices, depending on where you live. I’ve determined that bottles selling locally to me for >$70 or so is where it starts to be worth buying online (orders of 4 or more; mix-n-match). Cheaper than that and the local option is usually better. Just another perspective on the QPR discussion. Love the website, Scotch Noob. Keep sharing your experiences and thoughts and we’ll keep reading and commenting. Thoughtful, open discussion is what fuels the whisky world. Thanks for the insights, and thanks for reading! I’m just seeing this over a year later, so apologies for that late response, but I 100% agree with you. Here in WA state our liquor taxes add ~$18-$25 per bottle in excess costs, which drives reasonably-priced bottles out of my range quite often. For example, Ardbeg 10 in store here costs $60 (high to begin with), but commands $15 in added taxes, bringing the cost up to $75 which is ridiculous. I’ve found that it is almost always cheaper, often significantly so, to order bottles online and pay for shipping than to buy in-store. Thanks Scotch Noob, we appreciate your insights and experience! I am a working man with a wife and kids, so the idea of a “go zone” resonates with me. I cannot justify an alcohol expenditure in excess of $50 when there are mouths to feed and bills to pay. I pick out bottles in the $80-$90 range and point them out to my wife. For birthdays and holidays I recieve bottles in in the $80-$90 range. I have never purchased a botttle over $100. Maybe when the kids move out. While I have never ordered whisky online, I do travel nearly an hour to beat out local prices and selection. In rural America Oban 14 is $110!! Saving $45 on a bottle will often be the difference between drinking whisky and drinking whiskey. If you have paid attention you will note that a $65 bottle of Oban 14 still feels a little pricey to me. Thats my next point. NAS whiskies. Oban Little Bay and Talisker Storm are staples on my shelf at $35. Do I reccomend them above their mature siblings? No. For half price I do find them to be an enjoyable compromises, though. Theres a third trick I feel obligated to mention. Sales. I often find whiskey in the $70-$80 range on sale around $40. I have learned that these sales are often limited in duration and quantity. I have only ever regretted the sales I passed up. If there is a bottle outside of your price range on sale for a number your’re comfortable with, buy it. I promise the discount will add 5 points! $1,000 bottle of whisky might as well have three more zeroes on the end. Thanks for the comment, Bill! If you happen to have a Costco nearby that sells alcohol (probably Sam’s Club too, although I haven’t checked), they also have excellent prices despite low inventory. Ditto for Trader Joes in states that they sell alcohol. Worth checking out, and you actually don’t need a Costco membership to buy (only) spirits, or so I’ve been told. I’ve also found that some gems exist in the bottom shelves, and I can spread out my pricier purchases by interspersing them with blends like Bank Note 5 year, or any of the decent $20 – $30 bourbons. Cheers! This is great! Exactly how I make my decisions (difficult as they always are) standing in the whisky isle at the liquor store. I’ve found a couple gems below 40, though not many for my liking. Scotches I’d say I’m happiest 60-80 while bourbon is 30-50. I will admit the sticker is intriguing on those splurge purchases but I’ve rarely enjoyed a bottle after purchase that was 100+ I’ve gone 300+ a few times and had major regret! I suppose it’s all on the individual but at the end of the day I just want to sip something that I enjoy regardless of cost. Makes me a lot happier knowing I didn’t have to break the bank though! I feel like scotch is a relative bargain, even at $100/bottle. I live in the Wine Country. A $100 bottle of top quality cabernet comes out to $20/serving. A $200 bottle of scotch, which I’ve never bought, would be less than $12/serving. The Highland Park 18 I bought recently, while $140, is only $8/serving. For the cost of a quality case of cabernet sauvignon ($1200), you can start a pretty solid scotch collection.